The third meeting of the Vit-Buckle Society saw its share of once-in-a-lifetime surgical challenges. 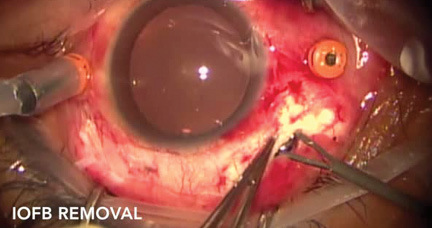 The Vit-Buckle Society (VBS) was founded as an informal forum for vitreoretinal surgeons to share videos of surgical challenges, innovative techniques, and successes. A difficult case can sometimes teach more than a perfect one. Presenting and discussing these cases allows VBS attendees to learn how to recognize, address, and manage complex surgical issues and improve patient care. In this installment of VBS Notes, Yewlin Chee, MD, reviews a presentation by James C. Major Jr, MD, PhD, whose experience at the intersection of obstetrics and ophthalmology reminds us all that we are doctors of the whole body, not just the posterior segment of the eye, and highlights the importance of working as a team with our nonophthalmic colleagues. Benjamin J. Thomas, MD, reviews a case presented by Harit K. Bhatt, MD, which emphasizes that every surgical step—in this case, diluting C3F8—must be closely scrutinized to ensure patient safety. 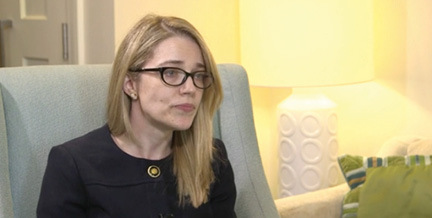 Joshua Mali, MD, reviews a collection of intraocular foreign body cases from Aleksandra Rachitskaya, MD, each of which required the retina surgeon to build on established retinal surgery principles while simultaneously individualizing the surgical approach in each case. We hope you find these cases as useful today as we did at the meeting. James C. Major Jr, MD, PhD, presented a case titled “Check Out This Baby!” concerning a young woman who was 36 weeks pregnant when she presented to his office with a superior macula-on retinal detachment with two small breaks. The audience was polled regarding what treatment they would recommend: a pneumatic retinopexy, primary scleral buckle, vitrectomy with or without scleral buckle, or wait for the delivery of her child before addressing her detachment. The audience voted to treat the patient with a pneumatic retinopexy, which was also the treatment Dr. Major opted to perform. The first of several issues related to her pregnancy was briefly discussed, namely her inability to receive nitrous oxide if she were to require anesthesia during her delivery due to the gas bubble in her eye. Initially, her retina flattened nicely, but she had a recurrent macula-on retinal detachment 2 weeks after the procedure. A discussion followed regarding the best treatment option for the patient (who at this time was 38 weeks pregnant). Several possibilities were discussed, such as a repeat pneumatic retinopexy or surgical repair of the detachment either by scleral buckle, vitrectomy, or a combined scleral buckle and vitrectomy. The timing of the proposed procedure was also discussed, including performing the procedure prior to delivery, recommending induction of labor for an earlier delivery and subsequent retinal detachment repair, or waiting until after spontaneous delivery to perform the procedure. The audience considered the relative merits and disadvantages of the aforementioned options. Immediate repair of the detachment would decrease the chance of the patient’s macula detaching; however, the logistics of a surgical repair, including type of anesthesia and difficulty with supine positioning, would present a challenge. A recommendation from one retina surgeon for early delivery of the baby also prompted concern of liability in the chance any complications arose from the delivery. Waiting until after spontaneous delivery would eliminate the latter concerns but would increase the risk of vision loss if the macula detached during the waiting period. In each case, a discussion with the patient’s obstetrician was recommended, which led to a review of how obstetricians manage the delivery of patients with extensive retinal pathology. Dr. Major explained that, due to a concern that Valsalva maneuvers performed during vaginal delivery could exacerbate preexisting retinal pathology such as extensive lattice or high myopia, many obstetricians would strongly recommend to deliver by cesarean section. Dr. Major presented a review of a small case series of pregnant women with high-risk retinal pathology. In each case, there was no progression of retinal pathology after vaginal delivery. Despite a general consensus among ophthalmologists that these patients need no special consideration from the standpoint of delivery method, Dr. Major described a recently published survey of obstetricians in which the vast majority recommended cesarean section for patients with a history of previous retinal detachment, previous laser, or high myopia. In the case of Dr. Major’s patient, labor was induced, and her baby was delivered vaginally. She underwent retinal detachment repair by scleral buckle and vitrectomy with C3F8 gas tamponade 3 days after her delivery. The decision was made to proceed with the combined scleral buckle and vitrectomy to maximize the likelihood of a successful repair and to minimize the patient’s need for positioning in her postpartum and postoperative period. Her detachment had progressed prior to her repair such that the macula was detached for a short period of time, and 3 months postoperatively, her vision was 20/30 in the affected eye. The case discussion concluded with an audience member cautioning against making recommendations to obstetricians regarding the method of delivery due to the potential liability incurred with these recommendations. If a gas bubble is present in the eye, then the obstetrician should be cautioned against using certain types of anesthesia; otherwise, the obstetrician should be counseled that there is no additional risk in a patient with retinal pathology associated with a particular method of delivery from an ophthalmic standpoint. The obstetrician should use his or her clinical judgment regarding which delivery method is most appropriate, and the retina specialist should monitor the patient closely before and after delivery. Yewlin Chee, MD, is a second-year retina fellow at the Massachusetts Eye and Ear Infirmary in Boston. Dr. Chee may be reached at Yewlin_Chee@meei.harvard.edu. Harit K. Bhatt, MD, presented the case of a challenging postoperative issue that cuts across subspecialty lines. The case interests vitreoretinal surgeons as well as neuroophthalmologists and glaucoma specialists. An 80-year-old female patient saw Dr. Bhatt for a second opinion following surgery performed by her primary retina doctor. She had recently undergone a repair of a macular hole with perfluoropropane (C3F8) intraocular gas tamponade and postoperative facedown positioning. Although no perioperative or intraoperative complications were reported, the patient developed severe periocular pain with intractable nausea and vomiting postoperative day 1. Upon examination, she was found to have elevated intraocular pressure (IOP) in the operative eye (36 mm Hg), and her vision was no light perception (NLP). Believing her symptoms to be derived from elevated IOP, her surgeons performed an anterior chamber paracentesis to lower the pressure. Yet the patient’s symptoms did not abate, and after a week, which involved being hospitalized for her symptoms and diagnosed and treated for cardiac dysrhythmia (neuroimaging was not performed), she returned to her surgeons with NLP vision in the operative eye, persistent symptoms of pain and nausea, and an IOP of 60 mm Hg. Repeat anterior chamber paracentesis was performed, but it did little to ameliorate the patient’s symptoms. The patient’s headache worsened and, when she showed signs of neurologic decline, she was eventually seen at the tertiary care hospital, where she underwent neuroimaging. 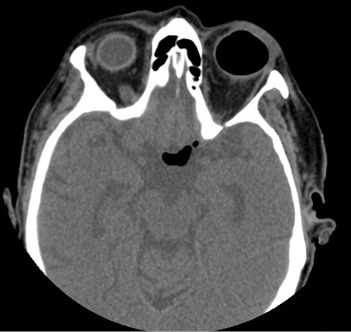 A CT scan of the patient’s brain and orbits revealed gross distention of the operative eye with an apparent gas infiltration of the optic nerve, which extended from the globe posteriorly to her brain parenchyma (Figure). Apart from her recent retinal surgery, the patient had no other risk factors for intracranial emphysema; thus, the proposed mechanism for this patient’s decline was migration of intraocular gas through some defect of the optic nerve to the brain. Of interest, the patient reported a history of both glaucomatous optic nerve cupping and an optic pit in the contralateral eye. Serial CT scans showed gradual resolution of the gas with concurrent improvement of the patient’s neurologic status, but the left eye remained with NLP vision, and the right eye sustained visual field loss secondary to likely chiasmal injury. Figure. CT scan showed gas infiltration of the optic nerve. The concept of intraocular tamponade spreading to the brain is not without precedent. Dr. Bhatt introduced a parallel case in which silicone oil seemingly progressed to the brain via an atrophic optic nerve. However, the real concern—as the panel quickly identified—was not the route of gas expansion, but the degree to which it expanded. An appropriate nonexpansile concentration of intraocular gas would not have led to this situation. Dr. Bhatt supplied the remainder of the story: outside records revealed that, due to a miscommunication between the primary surgeon and a scrub nurse, a 50% concentration of C3F8 had been used, rather than the 15% requested. Discussion ensued as to the precautions used by the session moderators and audience when drawing up gas for injection in the OR. One participant cited a series of 20 complicated cases stemming from intraocular gas, and 13 of them (65%) were caused by dilutional issues derived from no more than miscommunication, confusion, or distraction. Given the straightforward nature of the issue, surgeons should strongly consider drawing and diluting their own gas. On the heels of this point, though, another participant pointed out that in a recent survey of vitreoretinal surgeons, only 70% of respondents actually drew and diluted their own gas (drawing and diluting included directly observing the dilution of gas tamponade). Additional pitfalls in gas dilution were cited, including both the variability of the graduation on the gas syringes and the increased concentration of gas one obtains inadvertently by both pushing and pulling through the same filter (an increase of approximately 1 cc). One solution is to remove the filter when blowing out gas from the syringe or to put on a new filter. Possible solutions to the variability, including a new cartridge-based system for gas delivery with less confusing means of dilution, were discussed, but the universal lesson was the critical importance of the surgeon’s direct supervision of the process of gas dilution. One final precautionary point was raised: the importance of applying a medic bracelet to all patients with an intraocular gas bubble, including eyes filled with air only. This point directed the discussion to the diagnosis and treatment of an underdiluted gas bubble in an overfilled eye. The CT scan presented by Dr. Bhatt (taken on postoperative day 7) gave clear evidence of a 100% gas fill with no residual fluid pockets in the vitreous cavity—such a presentation, especially in the setting of elevated IOP, should raise immediate concern for this problem, as it demonstrates continued expansion of the gas against (or through) the eye wall. In these cases, anterior chamber paracentesis is ineffectual, as it simply permits further expansion of the gas bubble. Complete gas exchange, one participant highlighted, is the only definitive means of correcting the problem. Benjamin J. Thomas, MD, is a second-year fellow at Associated Retina Consultants in Royal Oak, Mich. Dr. Thomas may be reached at benthomas003@yahoo.com. It was an honor to attend VBS VICE as a travel grant award recipient. I was especially excited to hear Aleksandra Rachitskaya, MD, discuss trauma and intraocular foreign bodies (IOFBs), as my video submission for the fellows’ film festival also dealt with this topic. Dr. Rachitskaya began her presentation in traditional VBS fashion with eye-popping (pardon the pun) and jaw-dropping videos displaying a variety of IOFBs ranging from fishhooks to metallic nails. Dr. Rachitskaya said it is crucial to always suspect IOFBs in cases of trauma, especially in high-velocity projectile injuries and any cases involving children. Small corneal entry wounds heal quickly, especially in children, and a child might not report decreased vision as he or she just switches to using one eye. CT is the imaging modality of choice, and MRI is contraindicated in cases of possible ferromagnetic objects. B-scan ultrasonography can be used with small and self-healed entry wounds. Dr. Rachitskaya also mentioned the use of a small, portable metal detector, but this is not widely available. Dr. Rachitskaya emphasized that concurrent endophthalmitis with IOFB is a true emergency, as it can evolve rapidly. She presented a case in which a hypopyon advanced from 1 mm to 4 mm and IOP rose from 20 mm Hg to 60 mm Hg, all within 1 hour from presentation (during this time, preoperative logistics were being completed) in a patient with an IOFB and Enterococcus faecalis endophthalmitis. This dramatic patient presentation reiterated the time-sensitive nature of IOFB cases, especially when associated with endophthalmitis, underscoring the mandate that delay should be avoided in these cases. Regarding the devastating nature of delayed care’s resulting endophthalmitis in IOFB cases, an audience member suggested that in patients prone to delayed care (eg, those referred from a far distance or those waiting for OR logistics), retina surgeons should consider recommending immediate intravitreal tap and injection of antibiotics to halt infection progression while definitive surgical treatment is arranged. Dr. Rachitskaya agreed with that strategy, although she stated that there are no current studies to support this approach. Dr. Rachitskaya raised the issue of anesthesia choice in trauma and IOFB cases. She explained that the decision on type of anesthesia depends on the degree of injury and patient characteristics. She prefers general anesthesia in young patients and those with large rupture sites. However, if one has a cooperative patient with a small entry wound, no leak, and stable IOP, it is reasonable to consider monitored anesthesia care and retrobulbar block. The topic of wound construction and IOFB removal induced lively discussion. Dr. Rachitskaya reported that both 23- and 25-gauge vitrectomy could be utilized in IOFB cases. She recommended, however, that the sclerotomy wound used for IOFB removal be large enough to accommodate the IOFB. If the patient is phakic and does not have a cataract limiting visual acuity or has only a small eccentric cataract, a pars plana sclerotomy is ideal for IOFB removal, as the crystalline lens can be spared. Anterior chamber approaches could also be utilized if necessary in aphakic patients. Dr. Rachitskaya also recommended retina surgeons avoid using smaller wounds for IOFB removal, as doing so may promote instability in maintaining a grasp of the IOFB during removal, thereby increasing the likelihood of dropping the IOFB. If there is concern that a wound is too large, one can preplace sutures in the sclerotomy, presenting the option to quickly close the wound after the IOFB is removed. One audience member discussed another strategy of removing IOFBs. First, the surgeon grasps the IOFB and raises it to the anterior vitreous cavity. After removing the endoilluminator and plugging the instrument’s cannula (assuming the cannula is nonvalved), the surgeon can use a sharp blade or diamond knife with his or her free hand to incrementally enlarge the wound so it is barely large enough to remove the IOFB. Using the shaft of the IOFB forceps as a fulcrum while enlarging the wound will anchor the surgeon’s hand and aid in ensuring the enlarged wound does not become so large that the purpose of this maneuver is defeated. Such a tactic creates a perfect wound size for each particular IOFB, avoiding larger wounds prone to leakage and hypotony. Dr. Rachitskaya emphasized that IOFBs should be suspected in cases of trauma in high-velocity projectile injuries and any cases involving children. Small-gauge vitrectomy can be utilized in cases of IOFB. Enlarged pars plana sclerotomies used in IOFB removal allow a surgeon to spare the crystalline lens if there is no visually significant cataract present. Joshua Mali, MD, is a vitreoretinal surgeon at The Eye Associates, a private multispecialty ophthalmology practice in Sarasota, Fla. Dr. Mali may be reached at joshuamalimd@gmail.com.